I still can't understand why Apple goes to such great length to hide some of the iPhone's features in western iPhone. I'm referring to the popular smiley/emoticon/emoji images that are available in Japan, but not elsewhere. But now you can easily enable these secret emoji in your own iPhone... for free! Update: with iOS5, you can now enable the emoji keyboard under international keyboards without the need for this kind of workarounds, and here's a list of all the Emoji on the iPhone. And, in the Japanese keyboard section you'll be able to enable the emoji keyboard. You can even unistall the Spell Number App, as the emoji keyboard will remain active. 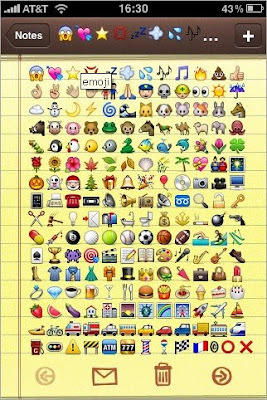 Also, keep in mind you can use these Emoji and Glyphs to name your iPhone Folders in iOS4! 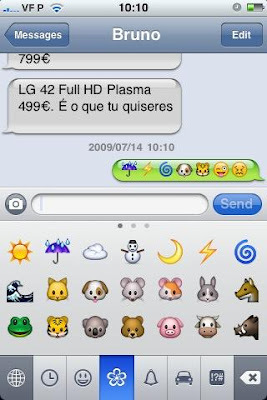 That was for iOS3, with iOS5 you no longer need this; you can simple enable the emoji keyboard just like any other. Just like the above post you no longer need this.